Perfect Liars Club is a smash hit comedy storytelling interrogation show from the USA that is launching in Tokyo on 6th October 2016. 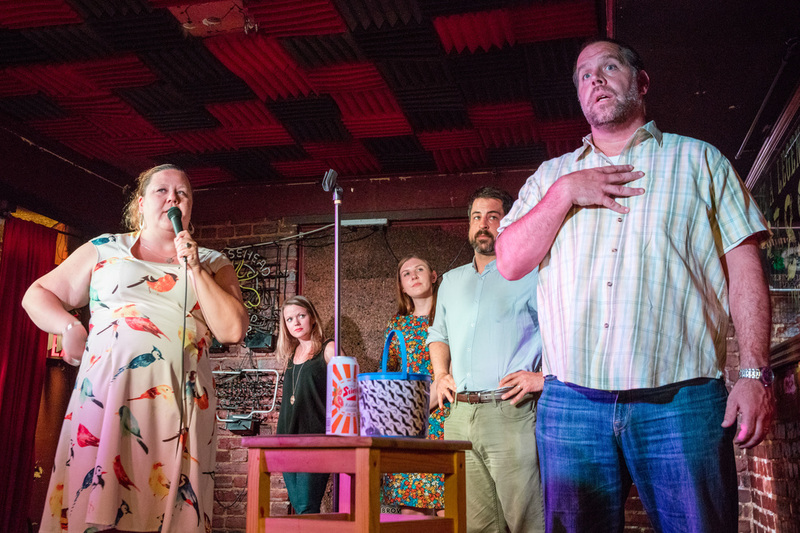 Originally started in Washington DC, USA in 2013 by Scottish storyteller Layla McCay, Perfect Liars Club quickly became one of the city's hottest shows with its simple but hilarious premise: Four people tell four stories. All are captivating but only three are true. Listen. Laugh. Suspect. Interrogate. Vote. Can you spot the liar? The stories are hilarious - but the interrogation is even better: you never know what questions will be asked, or what evidence the audience might demand of the four storytelling suspects in the determined quest to spot the liar. The prize is simply feeling very smug and showing off to your friends. 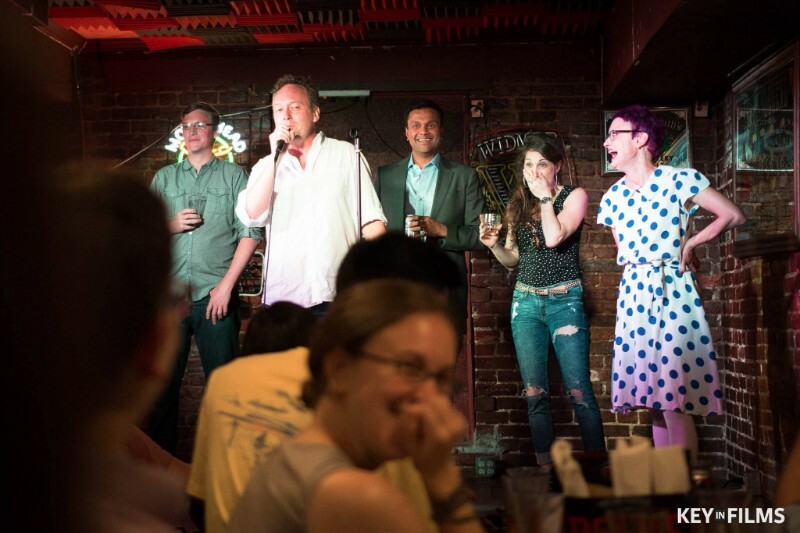 Perfect Liars Club plays monthly sold out shows in Washington DC, and sold out when it played at the Capital Fringe Festival in 2014 and 2016. Devoted audience members arrange for their grandmothers to buy their tickets for the monthly shows if they are at work at the magical moment when the tickets go on sale - sometimes tickets sell out in 90 seconds flat. On the night, people stand in line for hours in the hope of getting in. Perfect Liars Club has become an underground phenomenon. Why is Perfect Liars Club coming to Tokyo? With Perfect Liars Club founder Layla McCay moving to Tokyo, the time is ripe to bring the show's crowd-pleasing formula to the people of Tokyo. But the question is: will the Tokyo audience be shrewd enough to catch the liar? Why will Tokyo love Perfect Liars Club? Tokyo's English-language comedy scene and indie events scene are both growing in leaps and bounds - and gameshows have been long popular in this city. The show is bursting with charm, laughs, suspense, and the irresistable opportunity to play detective. 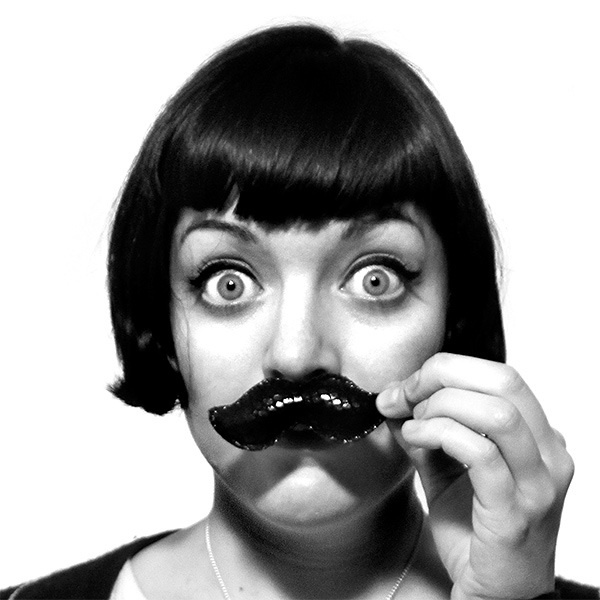 The storytelling suspects are local people - anyone with a crazy story can volunteer to perform. And the MC is Layla McCay, an award-winning funny storyteller who has performed in English and Japanese in the US (The Moth, Story District, Story League), London (The Moth, Spark London), and Japan (Apocrypha, OKomedyaki) - and writes the weekly Brit About Town guide telling us all about the events she thinks sound the most fun in Tokyo each week. When: Launching on Thursday October 6th 2016. Doors at 7pm, show at 8pm. How do I get tickets: Tickets will go on sale on September 9th at 1pm Tokyo time here. 1500 yen including a drink. How do I tell a story: Email us with a short description of your unbelievable-sounding story. If it sounds right for Perfect Liars Club, we will reply to discuss a performance date, give you advice, and arrange a coaching rehearsal over Skype to help you be fantastic on the night. Sign up here. How do I keep up with events: You can find shows listed here, sign up for our mailing list here, and follow us on Facebook and on Twitter @perfectliarstky. The five Perfect Liars Club liars at Washington DC's Capital Fringe Festival 2016: none of them were caught by the audience. Perfect Liars Club monthly show in Washington DC: The Interrogation. 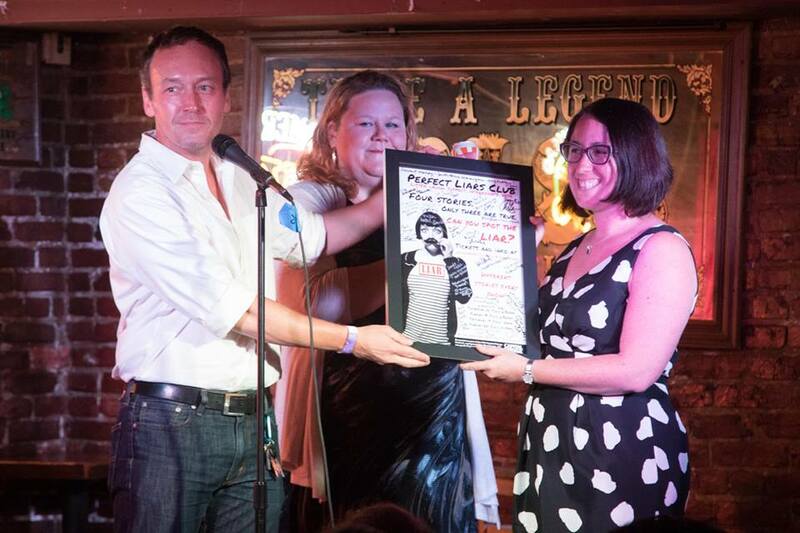 Perfect Liars Club Founder Layla McCay (far right) at her final night emceeing Perfect Liars Club Washington - she hands over the reins of the Washington DC show to Pierce McManus and Cara Foran (also pictured, left) and moves to Tokyo to start the newest branch of Perfect Liars Club. Photo credit: Keith Mellnick Photography.